Dr. Robert G. Cooper is the creator of the world-famous Stage-Gate® process, and was named the “World’s Top Innovation Management Scholar by the prestigious U.S. Journal of Product Innovation Management and winner of the best seminar leader of the year at Sweden’s Chalmers Institute in Goteborg. He is also a Fellow of the Product Development and Management Association (PDMA). 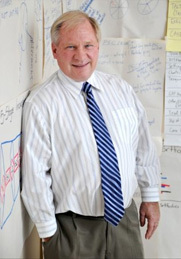 He has combined practical consulting with ground-breaking research for many years. Besides his best-selling books “Winning at New Products” and “Portfolio Management for New Products”, he has published more than 130 articles on R&D and innovation management. Dr. Cooper is Professor Emeritus at McMaster University in Canada and ISBM Distinguished Research Fellow at Pennsylvania State University in the USA. He is also President of the Product Development Institute offering innovation know-how and support around the world. Many companies in North America, Europe and Asia have introduced his methods, including 3M, ABB, BASF, Bosch-Siemens, Carlsberg, Caterpillar, Diageo, Dow Chemical, DuPont, Exxon Chemicals, HP, Honeywell, ITT, L.M. Ericsson, LEGO, Procter & Gamble, and Swarovski.